1- My son can’t say ‘pecan’ or ‘cotton’ properly! Even being raised in the South he must not hear me say them much. At 8yrs old he says the ‘pekin’ and ‘coddin’ – I need to record him saying them. 2. 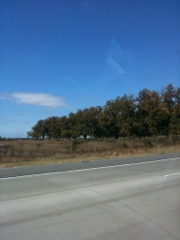 Why are pecan trees always spaced out so evenly in rows? 3. When traveling with a dog your only options for food is fast food and I’m SICK of fast food!! I’m dying for a real meal!! The closest I got was a Wendy’s baked potato; however they forgot to put the butter in the bag so even that didn’t satisfy me. 4. 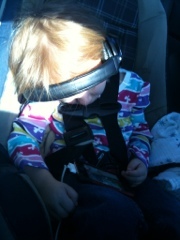 Kids can fall asleep anywhere! 5. I don’t like driving my husbands car because the left arm rest is too high and is uncomfortable. Since he drove most of the trip I’m not complaining. 6. 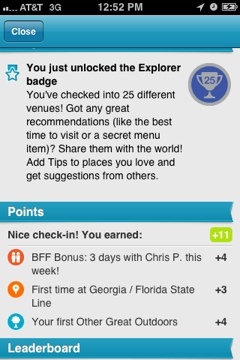 Foursquare thinks my husband’s my BFF because we spent the last 3 days checking in together. Awe! 7. Cars need to come with power strips these days! We had a total six items all fighting for the 2 plugs in the car. 8. My kids get along sooooo good! It wasn’t until the last 30 minutes that the were loud, cranky, and annoying. Why is it that every rhyme, song, and joke they tell one another has to include pee, poop, underwear, or eating brains? 8. My cat had a party, got drunk, and threw up around the house! I’m glad to be home! 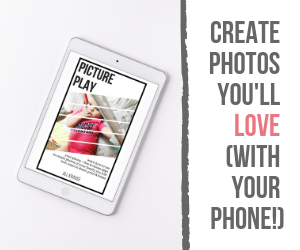 What things do you learn when you travel with your family?